★Durable Material – 600D Oxford Cloth + PP cotton + Oxford Cloth + Slip-proof PVC net, no smell and no harm to your pet. Protect the cargo area and back of your SUV from water, dirt, dander, pet hair and spills, and avoid claw marks on your car’s pristine paintwork while your dog jumps out of the back. The nonslip backing keeps the cover in place while driving. This luxurious cargo liner is beautifully designed, made of quality material which gives it a classy look. ★Protect Vehicle Clean – Protect your cargo area from dirt, garden stuffs, pets fur and claws, as well as keep your dog cargo liner dry and tidy all day. Long bumper flap that extends down to protect your bumper from claw marks or scratches when loading and unloading. ★Easy to Install – Install in seconds by looping the adjustable straps around the headrests of the back seat. With the seat anchors and our reinforced quick release headrest straps install is easy and will stay secured in place in seconds! The car boot liner is machine washable, and can be easily cleaned with a damp cloth or just vacuum in day-to-day use. There is a pocket can be for storage.The one pocket can put inside a leashes, bags or anything your pet may need. 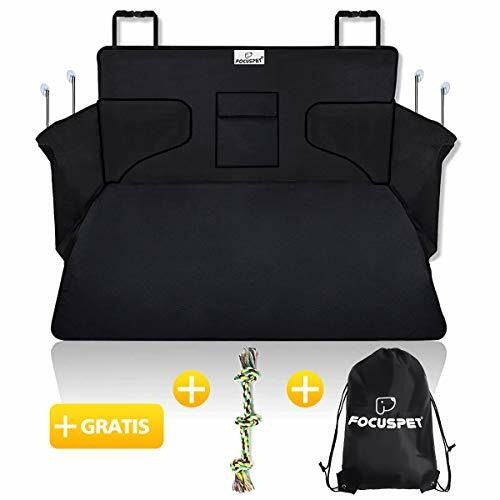 【Durable Fabric and Soft Padded】Focuspet Pet Seat Cover, 600D Oxford Cloth + PP cotton + Slip-proof PVC net to keep the pet seat cover in place and clean even on leather seats and help your dogs stay in place cozily. Welcome to compare to other seat. 【Waterproof and Scratch Proof】Made with quality heavy duty water resistant oxford fabric, easy to clean and wipe out with a damp cloth. Protect your seat when having fun outdoors,no need to worry the pet scratch the seat. Can withstand heavy weight dogs. 【Easy to Install】Easily install with quick release clips. 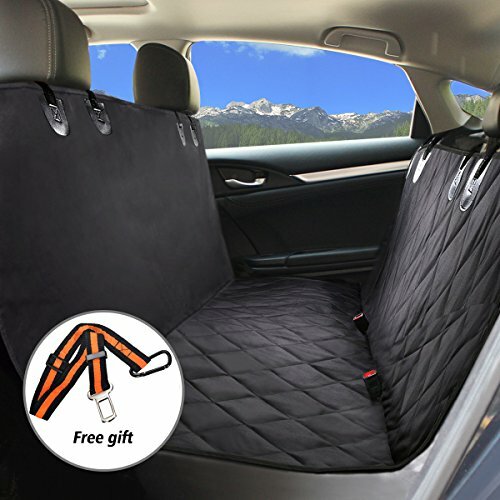 Seat anchor can insert to the crevice to fasten the cover, adjustable plastic clips that attach around the headrest in the front and back to fix cover firmly.You can even change itinto a hammock to make your dog fell safe and secure.